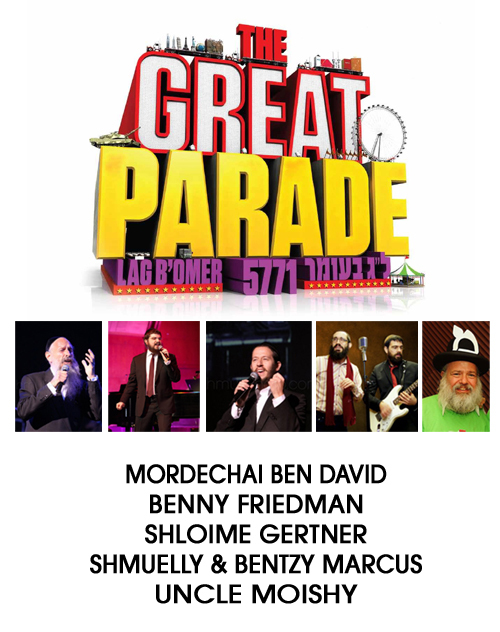 Great Parade 5771: MBD, Benny, Gertner, 8th Day & Uncle Moishy! Last year, over 35,000 children and their families participated in the greatest Jewish unity event ever. With your participation, this year’s celebration will be even grander, leaving a greater impact on all! Throughout the parade, a lineup of sensational entertainers will perform for participants, drawing them into the celebration! Bello Nocks, headline act of the Ringling Bros. Barnum & Bailey Circus: The Greatest Show On Earth. Bello will be a highlight of this year’s Great Parade. A lively troupe of jugglers and clowns will entertain the crowd during the Parade and througout the day. An all-star lineup of singers will perform medleys in tribute to Rashb”i, in assertion of Emunah and in praise of Am Yisroel! The Great Parade 5771 will celebrate themes of Jewish pride and practice on a scale that has never been seen before. Flat bed trucks up to 54’ long, will carry colorful depictions of Shabbos, the Chagim, Kosher food, Ahavas Yisroel, Eretz Yisroel, Pirkei Avos, Simcha and much more. Led by the US military marchers, more than 10 bands representing local Yeshivas, schools and organizations will march to the rhythm of Lag B’Omer! Over 100 schools and groups will march in the parade holding personal banners proudly. The Parade MC will announce school names and cities for all to cheer! The cast of Itche Kadoozy, Mitzvah Boulevard, Uncle Moishy and many others will sing, dance and mingle with the crowd!